More is not always better, and that is true for families. But many women in Afghanistan don't realize they could choose to prevent pregnancies. Aunohita Mojumdar writes about a 37-year-old woman with 10 children for the Women's News Network: "Like most Afghan women she has little say in the decision-making of the size of her family, or her own reproductive health. She has almost no concept that the number of children she has could be a matter of choice." Mojumdar explains the cultural forces that influence large families, including increased earning potential and additional household help. Of course, many, multiple pregnancies can pose health risks for women and their children, particularly when health care is not widely available. Decisions about whether a woman can use birth control, even for mothers who have health complications, are made at whim by husbands and imans. "Custom and tradition are often confused with religious edicts in Afghanistan and it has been an uphill battle for health professionals to break down these deep-seated beliefs. In order to do so, they are using religion as the clinching argument," Mojumdar writes. "The Koran, talks, for example, about the need for a woman to breastfeed her child for two years, a natural method of contraception that would ensure a gap of at least two years between delivery and conception. Afghan health professionals are using this as the main argument in favour of birth spacing." Women find new paths. 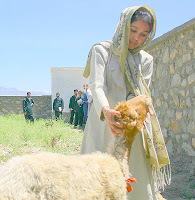 Above, Fareba Miriam is the eldest in a family of 12 and became the first woman to enroll in a para-veterinarian training program that USAID is running in Afghanistan.